Keto carrot cake, the perfect solution for those on a low carb ketogenic diet missing carrot cake. It’s bursting with flavor and frosted with a rich cream cheese frosting for the ultimate treat. 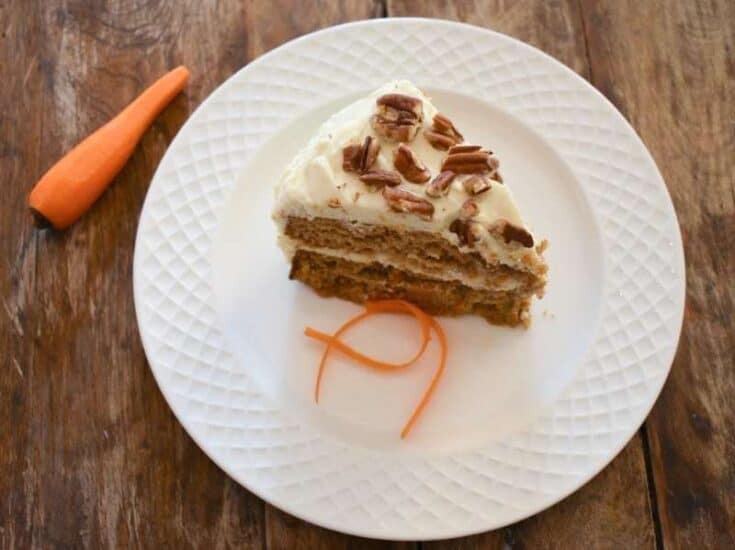 Fasten your seatbelts because I am about to share with you a fabulous keto carrot cake recipe that’s going to make your keto lifestyle a delicious breeze. This recipe is a beauty and I can’t wait to share all the details with you. If you’re a regular reader of our blog then you know that the recipes I share with you usually start out as a craving for the traditional high carb version. The way I saw it, if I was missing a carrot cake there had to be others who did too. Or maybe that was just my way of making sure I attempted to make the best keto carrot cake for the both of us. Just keeping it real, since the majority of my recipes usually start with me having a bit of an internal battle. I also have a complete list of Keto Cakes that as a fan of cakes I encourage you to also visit. Make sure you remember to also check out our Keto Cream Cheese Recipes for other delicious recipes that feature cream cheese. So, I’ve been tossing with the idea of transforming my old recipe for carrot cake into a low carb option for a good bit now. Some would say my desire to create not just a good enough keto carrot cake, but an amazing one caused me to stall its creation. But in the case of this recipe, I think I kept avoiding the creation of a carrot cake that was low in carbs because I was afraid it wouldn’t measure up to my expectations. I also was not too sure about sharing a recipe that featured carrots as a main ingredient on the blog. For the simple reason that I know, some diehard keto people won’t even allow carrots into their diet. But it’s always been my aim to accommodate as many people as possible with my recipes so that no one feels excluded. Which is why my last post was a guide for vegetarians wanting to do keto. Thankfully, although carrots are a root vegetable, in their natural state they are still pretty low in sugar/carbs. And when you consider that I only used two cups of grated carrots in this low carb carrot cake, it’s not a prohibitive option, at least for most people doing keto. Yes, my keto carrot cake may be a tad higher in carbs, but if you factor in the fiber in this recipe, plus properly keto meal plan you can safely include it. Like I mentioned earlier a good carrot cake in my book strikes the perfect balance of sweetness to spice. It also needs to be moist, because a dry carrot cake just isn’t very appealing. 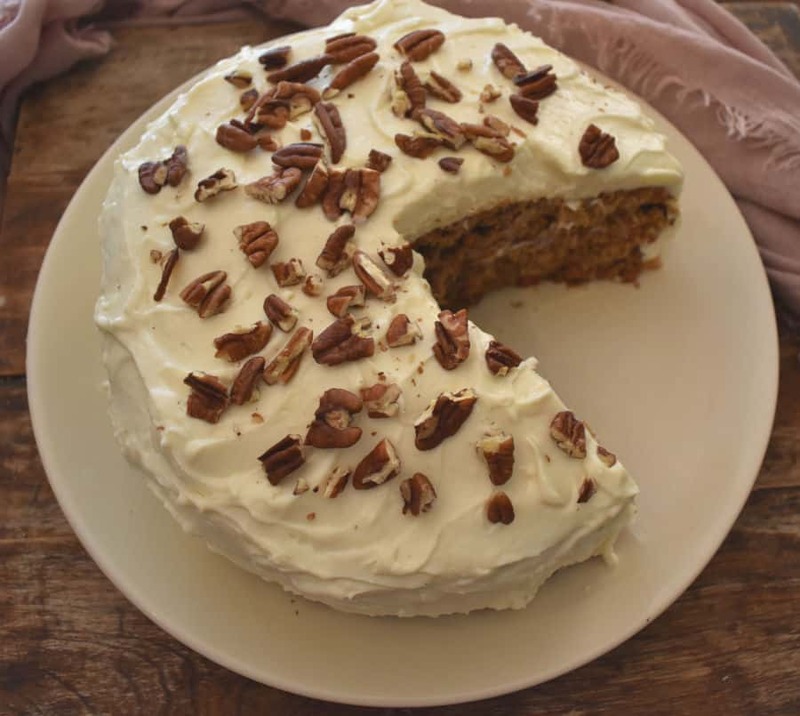 One bite of my keto carrot cake should remind you that just because you’ve chosen to adopt a ketogenic lifestyle, it doesn’t mean you have to forget the classic recipes you grew up on. Let me start off by saying, that the vast majority of my recipes are very easy to make and have minimal steps. In the case of my keto carrot cake recipe, it has a few more steps than my usual offerings. It’s why I decided to explain the recipe a little more than normal. So, rest assured that I am here to guide you each step of the way. Let’s start off by making sure you have all the necessary baking tools to execute this recipe. If what you are wanting is a two-layer keto carrot cake, then you will need two 9 inch baking pans. You will also need parchment paper. For the sake of convenience, you might want to use pre-cut parchment rounds. Of course, you could also just cut out the rounds yourself. The reason for the parchment paper is so that you can easily unmold your cakes. If you rather keep things simpler and don’t want to fuss with making it a two layer cake, then you can, of course, bake the keto carrot cake in a 13×9 oblong pan and even frost it in the pan instead. I encourage you to visit our post on keto baking for additional tips that will help you. If you know something about baking, you know it’s a bit of science project. So if you want consistent results, you’ll need to follow my instructions for my keto carrot cake exactly. A recipe like this is not like my keto cream cheese pound cake that you can easily customize. Yes, you can opt to use let’s say a different type of nut, but everything else should remain the same. Otherwise, I can’t guarantee the same results. Let’s begin by preheating your oven to 350 degrees, and greasing and lining your baking pans. The next step is grating your carrots. In this recipe, I suggest you not use pre-cut grated carrots because they are much drier and you need the moisture that freshly grated carrots impart. You don’t want to end up with a dry keto carrot cake, right? Then freshly grate them. I use my food processor to quickly do so. You could alternatively use a box grater. The next step will be to combine all the dry ingredients in a medium-sized mixing bowl. Add your almond flour, spices, sea salt and baking powder to the bowl and mix well to incorporate all the ingredients. Now measure out both the shredded unsweetened coconut and chopped pecans and keep them nearby. You will add these last to your keto carrot cake batter. Note that the full recipe is at the bottom of the page. The following are my baking tips to ensure that your keto carrot cake comes out perfect. When it comes to choosing a favorite baking tool, my Kitchen Aid mixer makes the top of the list. If you don’t yet own one you can of course also use a hand mixer to combine all your ingredients. It’s important to use an electric option though so that you get enough aeration in the batter. Start by beating on high your softened butter with the two sugar substitutes. You’ll notice that besides using my favorite brand of erythritol I use sukrin gold in this recipe. The use of brown sugar substitute makes a difference in this keto carrot cake, so I wouldn’t omit it if you want to ensure the same results. Alternatively, you can use Lakanto Golden and their granulated sugar substitute. Once your sugar substitutes and butter are light and fluffy you can begin to add your eggs one at a time beating well after each addition. Now that, that’s done, you can proceed to add the grated carrots to the mix. Note: Make sure that when you measure out the two cups of grated carrots that you do not over pack the measuring cup. After stirring in the carrots, add the heavy whipping cream to the batter and mix well to combine. It’s now time to add your dry ingredients. Set the mixer to the medium-low setting and gradually add the dry ingredients to the wet batter. Once all the dry ingredients have been added, you can then fold in the grated coconut and pecans. At this point, you’re ready to add your keto carrot cake batter to the cake pans. Do your best to evenly distribute the batter between both 9-inch pans. Or go the easy route and use the one large pan. Place your keto carrot cake pans in the middle rack of your oven and bake between 30-35 minutes. Your low carb carrot cake will be done when you touch the center and it bounces gently back. You could also insert a toothpick to check for doneness. Particularly when making a layer cake you don’t want to overdo the inserting of toothpicks to check if it’s cooked, since doing so could mess with the structure of the cake. The last thing you want is for your cake to break in half as you unmold it. But no need to panic because even this can be remedied with my delicious keto cream cheese frosting. You do know that keto frosting fixes everything? While your cake is baking you want to make your keto cream cheese frosting. To do so beat on high the softened cream cheese and butter until light and fluffy. Making sure to scrape the bowl several times in the process. Beat on high-speed for about 2-3 minutes. Note: that you want to use your whipping attachment to get the best results. Or use the hand-held mixer if you do not own the Kitchen Aid attachment. The point is you want something with a little power for best results. Next, add the swerve confectioners sugar. It really needs to be powdered erythritol if you want to achieve the perfect consistency. If you haven’t tried Swerve’s version of powdered sugar, you don’t know what you’ve been missing. 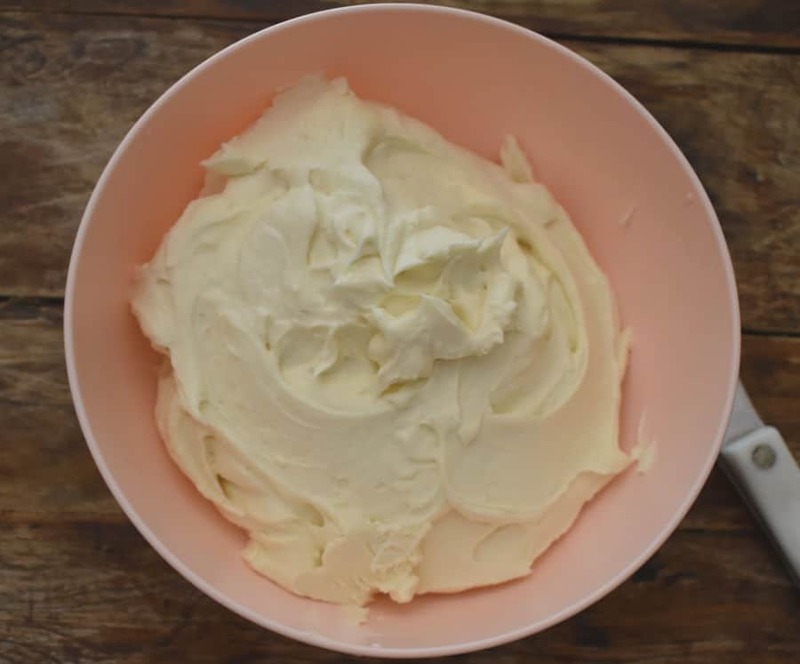 It plays an important role in this keto cream cheese frosting recipe. So do yourself a favor and get yourself some. Trust me you’ll be happy I introduced you to it. To the now perfectly blended cream cheese batter add the heavy whipping cream a couple of tablespoons at a time. Making sure you are still beating at high-speed as you add the cream. The keto cream cheese frosting should come together rather quickly at this point, so don’t over mix. You don’t want the heavy cream to start to turn into butter. What you are looking for is that the addition of cream to your frosting actually makes it fluffier. This should take no more than 2 minutes to achieve, maybe less. Set the frosting aside on your kitchen counter in an area that is not too warm. You really don’t want to refrigerate your frosting at this point because it will then be harder to spread. By now your keto carrot cakes should be ready for you to take out of the oven. Allow the cakes to cool in the pan for about 10 minutes before unmolding. Then place them on a cake rack to completely cool. Remember if you’re impatient and don’t wait, the warm cake will melt the frosting right off. Y esto no es bueno (not good). Once your cake is completely cool you are ready to assemble and frost your keto carrot cake. Remove the parchment paper rounds from your cake. The side that had the parchment paper is the one you will frost. Note: before adding the cake to a round plate or cake stand, arrange 3 small pieces of parchment in a triangle shape on the cake platter. This way as you frost your keto cake, the platter can remain clean. Once your cake is completely frosted you can gently slide out the parchment paper from underneath the cake. This added step just helps you keep thing neater. Place the first cake layer on the plate and add about 1/2 cup of frosting making sure to spread evenly to the edges. Add the second layer and repeat the same steps you did with the first layer. Next spread a generous amount of frosting to the top of the cake spreading the excess frosting to the edges of the cake. Gently smooth the frosting down the sides of the cake. Add more frosting to the sides of the cake until it has been fully coated. Lastly, sprinkle your keto cream cheesecake with the remaining 1/2 cup of chopped pecans. I’m happy to report that this easy keto carb carrot cake completely obliterated my craving for traditional carrot cake and allowed me to remain faithful to the lifestyle. My keto carrot cake is jammed packed with flavor. This is due in part because I was quite generous with the spices of cinnamon, ginger, and nutmeg. But also because it was frosted with a rich keto cream cheese frosting and yes the frosting recipe is included. You’re welcome. Come January of this year it will be five years since Randy and I decided to make a ketogenic diet a lifestyle choice. I must tell you that even writing that down sounds quite surreal to this girl. Given my past addiction to sweets, it’s pretty incredible that I’ve stayed the course consistently for this length of time. 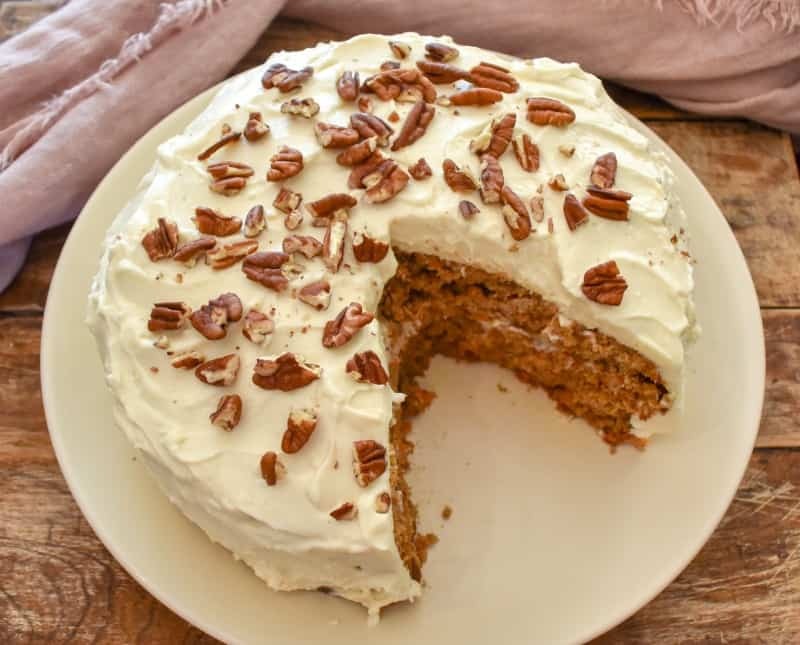 Then again, I will admit that creating recipes like this keto carrot cake to replace the sugar-loaded ones I used to enjoy have made the lifestyle not only possible but a lot easier. I’m also very grateful that it was a journey that we took as a couple. Randy and I linked arms and made a decision to fight for our health together. It’s not only been a blessing to our health but even our marriage has grown stronger. 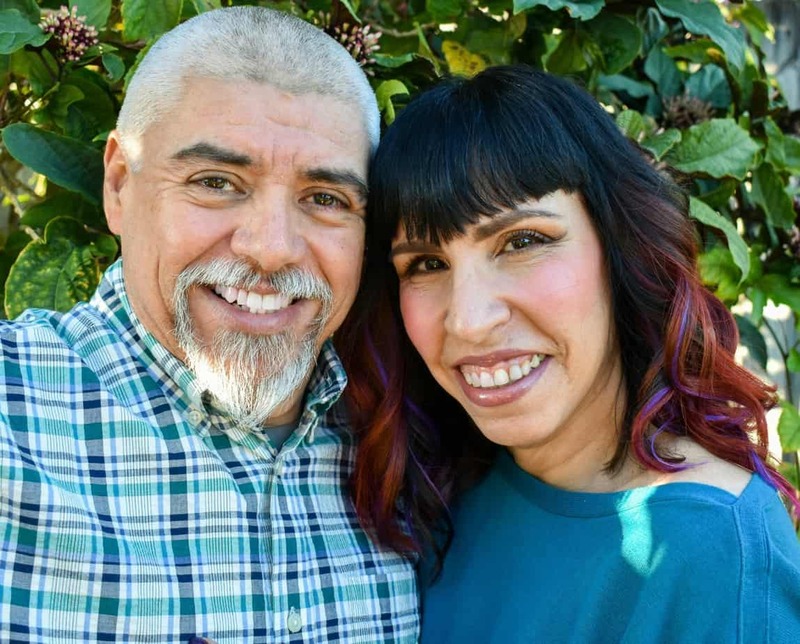 Although having low carb keto recipes to stay on track has been an important factor, I don’t think we would have remained committed if it wasn’t for the fact that we chose to combine the keto diet with our Christian faith. Let’s get something clear because I don’t ever want you to think that staying the course comes always easy for us. Trust me, we get tempted just like everyone else who has made a decision to cut out junk food from their diet. But we’ll also be the first to admit that we get lots of help from above. So, we never feel like we have to rely on just our strength alone. Thank you, Jesus, for your grace! I must also take a moment to tell you that as much as I love a great slice of carrot cake, there is someone in our family that loves carrot cake even more. Yup, hands down that award would have to go to my baby sister Lisa. Something you should know is that although Lisa loves her carrot cakes, the chances of her ever making one from scratch are pretty slim. LOL. Darn sibling rivalry, it still pops its head every once in a while. Now don’t misunderstand me, Lisa has many talents, but baking from scratch just ain’t one of them. But that’s ok because she’s got me for a sister. She might not have had the baking gene passed down to her. But don’t feel sorry for her, because she got the lion’s share when it came to beauty genes. So yeah, there’s that. Lisa may not yet bake from scratch, notice I said yet. But she will let you know very matter of factly, that she can, however, make the most amazing carrot cake out of a box. My plan is that after she tastes my keto carrot cake, she’ll be so swooned by it, that she’ll finally decide to give the low carb lifestyle a try. LOL, yes I’m willing to bribe her. But this girl is determined to see her baby sis at least give keto a fair attempt. Knowing that if it helped me, it could also benefit her on her journey to better health. 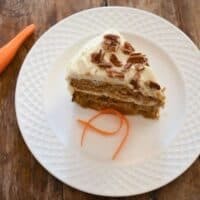 I sure hope you will give this ultimate keto carrot cake recipe a try. Once you do, make sure you remember to tag us on Instagram and Facebook. It’s what keeps this girl encouraged to keep sharing and perfecting her recipes for you. The ultimate recipe for keto carrot cake. It's the perfect balance between spices and sweetness. This recipe produces a moist delicious keto cake. Preheat the oven to 350 degrees. Grease both the bottom and sides of two 9 inch pans. Line the cake pans with parchment paper. In a large bowl cream the butter and both sugar substitutes until light and fluffy. Add the ½ cup of heavy whipping cream and combine well. Add freshly grated carrots and mix well till fully combined. In another bowl combine the almond flour, baking powder, spices. Lastly, stir in the chopped pecans, and shredded coconut. Transfer the batter evenly between the two prepared baking pans. Bake for 35-minutes or until done. Allow the cakes to cool in the pan for 10 minutes and then transfer to wire rack to cool thoroughly. While the cake cools make the cream cheese frosting. Beat on high speed the softened cream cheese and butter until light and fluffy. Making sure to scrap the bowl several times. Beat this mixture on high between 2-3 minutes. Note: you want to use your whipping attachment to get the best results. Or use your egg beaters if you do not own this attachement. Next add the swerve confectioners sugar a little at a time. To the blended cream cheese frosting batter add the heavy whipping cream a couple of tablespoons at a time on high until light and airy. About 2 minutes. This recipe makes 4 1/2 cups of frosting. When the cakes have cooled completely place the first layer onto a cake plate. Add about 1/2 cup of frosting to the center of the first layer making sure to spread evenly. Add the next cake layer on top of the first and the add about another 1/2 cup of cream cheese frosting to the center of the second layer. Spread frosting evenly to edge of the cake. With the remainder of the cream cheese frosting, frost the sides and top of the cake. Top the frosted cake with 1/2 of cup of chopped pecans. Hi Laurey, You can certainly use less cinnamon but it makes a large cake and this girl loves her carrot cake to be full of spices. You can safely reduce by 1/2 and it won't affect the integrity of the recipe. Hello Hilda! I am really looking forward to trying this keto carrot cake. I am just wondering if this is a recipe for high altitude? I live in Denver Co and a lot of the recipes I've used are not. Hi Denise, I am sorry Darling but I haven't had the honor of testing this recipe at high altitude since I live in the flatlands of Florida. However, I really don't anticipate it being an issue since it's a pretty stable cake. If you try please let us know how it goes. Hey there. I’d love to make this recipe but divide between 6 inch cake layers and make 3. Does this cake stack well? Is the crumb a lot like a traditional carrot cake? Also, I’d like to omit the coconut. Does that throw anything off as far as baking? Thanks! I’m excited to try it! Hi Christine, Although, I haven't tried making it into a 3 layer cake it should work well. The cake has a great crumb and as VERY close to traditional carrot cake. We have been tagged on social media with many pictures of this cake and have received raved reviews. Check back once you make it and let me know if it works out as 3 layer cake. Enjoy! Hi Pamela, Feel free to freeze. You should have no issue with it being frozen, defrosted and then assembled. By the way, enjoy those many celebrations darling! The flavor of this cake is amazing. And yes very darn near the real thing. even tho I waited till cakes were cool when I tried to get bottom layer onto cake plate it broke into 20 pieces. And yes I glued it back together with icing and was extremely gentle in getting the top layer on. Fortunately it was a home desert, and didn’t need to impress anyone. My question is what might I have done to make it so crumbly. I used exact ingredients and made as directed. Hi Becky, Not sure what could have happened my guess is that it probably needed to bake a little longer. Question can we use Monk fruit classic and Monk fruit golden lankanto as the sugars erythrol and swerve just have a horrible aftertaste to me? Hi Holly, Yes, of course, you can. When purchasing Lankanto use our code FITTOSERVE at checkout and get a discounted price. I too love their products. Enjoy in good health. Can this be made into individual cupcakes? If so, what would the bake time be? I want to freeze thee cupcakes to use only a couple at a time because there's only me in my household. Thanks! Hi Lynn, Several readers have made cupcakes you should get at least 2 dozen. You can bake for about 20 minutes at 350 degrees.